Old Westminster Winery was full of energy when I showed up, having just completed bottling a 2017 Nouveau, their first attempt at that style of wine. Nouveau, made famous by the French region Beaujolais, is a light style wine that by French law (when it is produced there) must be sold within the same calendar year that the grapes are harvested. Traditionally made from red grapes, this means as much aging as to mean very little. The wine ends up being a very pure expression of a red wine, something we consumers almost never experience as the reds we drink usually spend a fair amount of time aging in oak barrels that alter everything about the wine. It’s extremely difficult to find Nouveau wines from anywhere other than Beaujolais, which is to say for someone like me, a frustration. The winery’s crew was running around, the bottling truck humming on the crush pad, but here came Drew Baker, the winery’s vineyard guru and my host, sauntering across the lawn towards me as I got out of my car, a big smile on his face delivering a warm welcome. What a way to arrive. And that’s Old Westminster in a nutshell: “what a (fill in the blank)” said with great esteem. Jumping way ahead to right before I left, Drew took me to a tank in the winery and poured a sample of a wine called Farmer’s Fizz, which will be sold in a 375ml can (the equivalent of half a bottle). As we tasted it, Drew’s sister Ashli, who runs the wine club (and many other things), came over and showed me the video that would announce the canned wine project. Both beaming with pride, they talked about how they had long schemed the project and were still a bit nervous about how it would do. “Do you think it’ll cheapen our brand?” Drew asked. What a stupid question (sorry Drew). Old Westminster is developing a reputation for being on the cutting edge of the industry, and not just in Maryland. What Drew, Ashli and their sister Lisa (who makes the wine) are doing has drawn praise from every serious wine person I know who has tasted their wine or spent time with them. I’m clearly a cheerleader, as is nationally known wine writer Dave McIntyre, who has written about them several times in The Washington Post. Despite being more than capable of selling their entire inventory through their wine club and out of their tasting room, their wines are being distributed around the tri-“state” area of Maryland, Virginia and the District of Columbia, as well as in Chicago and San Francisco. They may also be available further north up the Atlantic Coast in the near future. That’s what happens when distributors active in some of the very top markets in the country taste their wine. It’s not just the killer juice that sells people on the winery, it’s the fun and adventure they create for their customers by making things like a Nouveau and canned wine. And, oh, by the way, they now have a skin contact (a.k.a. “orange wine”) pinot gris available as well that is, of course, a complete joy to drink. Then there’s the expanding line of pet nat wines that sell out in no time. And, of course, there are the bottled still wines that are, as I’ve written before and will intimate again in this post, world class. Put all of this together and you have a winery doing a lot of things that a lot of people appreciate. I tasted Farmer’s Fizz, and no, Drew, your reputation won’t suffer. If anything, it will improve. Old Westminster has expanded; the second room is new. How does all this magic happen? It’s hard to describe in one post how much thought these Baker kids put into each and every situation, each and every decision, they make. Here’s one example. The first wines we tasted were “two chardonnays done two ways” from the 2016 vintage. Hailing entirely from the home vineyard (their estate), roughly half the grapes were picked on the early side with the rest harvested five days later. Both were fermented with indigenous yeast. Although they had originally intended to make one blend, as the wines were coming to life in the winery, they realized they had two distinct wines, and so treated them differently and bottled them separately. One was almost entirely raised with stainless, the other a combination of 50% new French, 25% used French, and 25% stainless. The results were distinctively different wines that could be appreciated as coming from the same vines, and better than an amalgamation of the two would have been. Seems like an obvious choice, then, to do two different wines, right? Well, not necessarily. The amount of effort required by dividing the harvest into two separate wines is bigger in time and money than making a single wine. Most wineries would’ve stuck to the original plan. The Bakers made the choice to follow where the grapes were taking them. Here’s a second example. The Baker family purchased serious acreage on a property called Burnt Hill a year or two ago where they will plant a large vineyard. They consulted with experts, did a ton of research, dug soil pits and tested the crap out of the land, and thought long and hard about what to plant there. The driving question wasn’t “what grape do we need to sell out every vintage?” It was, “what will grow best here?” And it wasn’t just the varietal, it was the clone. Or clones, because the plot is large enough with diverse soils and nutrients to benefit from a variety. Roots stocks are likely a question, too. Up until this visit, I had been told, it’s going to be all about cabernet franc, though different clones for different parcels. Fine, great, I love a good cabernet franc, especially if it’s grown where it should be. Their 2014 Antietam Creek cabernet franc is special, they know how to make the varietal. Not Burnt Hill, but Maryland is gorgeous, right? But I love syrah more than cabernet franc, and Drew knows that, so when he told me that research on Burnt Hill had continued and that they now intend to plant parcels of syrah near the top of the hill, I got excited. I got excited because I can’t wait for an Old Westminster syrah – if anyone in Maryland is going to produce the best syrah, it’s going to be them (no offense to the current banner carrier of Maryland syrah). And it’s going to be them because, and this is really why I got excited, the amount of research and study that went into that decision is what produces the best wine. I’ve not known a single winery that puts this amount of time and effort into deciding what to plant, let alone what to produce, and does it seemingly purely from the perspective of ‘what can we do best?’ Most wineries, they’d buy the land, do some research, and lay down vines sooner rather than later; let’s get the revenue stream going. The diligence with which the Bakers are approaching Burnt Hill is going to yield amazing wine. A final example: the canned wine project. To be fair to Drew, because I mocked him about this above, the consumer jury is still out on canned wine. The major projects already rolling in this category are decent but not serious wine. Old Westminster, for all the fun they have, only put out serious wine, even if it’s playful. When Ashli showed me the announcement video, it reminded me of the professionalism and thought they put into their marketing. The design of the can is beautiful, the production of the video as good as they come, and the themes of the video will resonate with consumers. Look at their Facebook page. Check out their regular Facebook Live #WineForDinner series and, I guarantee, you will learn something new about wine every time. Do yourself a favor, take the next two minutes to watch this video. 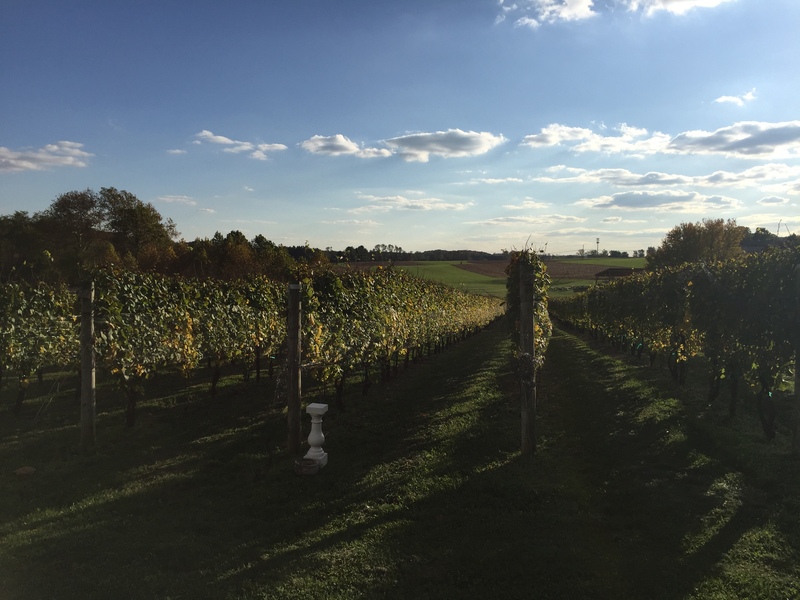 It encapsulates what I think Old Westminster is namely about: an effort to make world class wine in Maryland in a way that people enjoying it understand why it’s so good and feel like they’re an integral part of it. Drew and I talked a bit about how it is that Old Westminster gets to be so playful. The answer, he says, is their ability to “enjoy a unique position flexing experimental muscles” that is afforded to them by their direct-to-consumer sales model. Visit the tasting room and you may well be served by Drew or one of his sisters. This gives them the opportunity to explain why their wines are so cool, and why one should try a pet nat or an orange wine. It means they can convey to you why you shouldn’t be surprised that Maryland wine can taste this good. If Old Westminster was relying on other people to sell the wine, they’d have to convince “the trade” of these things, and then hope that their distributors and the retailers take the time to try the wines, let alone understand them and, and this is really a stretch, push them with customers. On the rare occasion a distributor wants to carry their wines, they know it’s because the distributor gets it precisely because selling Old Westminster in Illinois or California is going to take some perseverance. Distributors are about sales, and so will only take on something like Maryland wine if they’re true believers themselves and willing to hustle. There has to be some wine geek elements to this post, and here they come. Since they were bottling the Nouveau, Drew and I spoke briefly about the 2017 harvest. He described it as a vintage he’d take again, but one that, while solid, will be forgotten in ten years. It began early and warm; Drew recalled pruning in March wearing a t-shirt. June and July were hot with sporadic thunderstorms, which is fairly common. August, however, took a turn for the worst, delivering unusually cold and wet conditions. At the end of the month, Drew felt very pessimistic knowing that there hadn’t been any growing degree days (meaning days warm enough to continue ripening the grapes). Thankfully, September was kind to the vintage and saved it. Temperatures warmed and no rain fell. Harvest came about a week earlier than normal, but the duration of it remained normal. We tasted a number of 2017 wines in tank, and of course, tasted the 2017 Nouveau from a bottle that had been filled and sealed no more than an hour earlier. I’m excited for the final products because the Bakers are making them and will give customers the best of the vintage can offer. On to the tasting, which I’m going to cover with formal notes below. I’ve now had probably twenty or more wines from this producer, and all have been good. More than a few have been great. As the family expands their projects, I have no concern that they can maintain the quality. The Bakers seem to learn and grow with every harvest, and I imagine the quality will only improve the more they experiment and experience. When wines are provided to me for free because of this website, I note that. I wasn’t charged for the tasting or the visit. However, I did come home with eight wines that I purchased myself as part of my wine club membership. Old Westminster is a project of passion for the Baker family. I am all too happy to be a paying beneficiary of their work, and am honored to be allowed to spectate from time-to-time. One note: some of these wines are yet to be released, and so retail price points are unknown. Wines that aren’t given a value rating fall into this category. 2016 Premier Chardonnay – Aged in 50% new French oak, 25% once-used French oak and 25% stainless steel. The reticent nose is honeyed and slightly buttery but will fill out with some bottle age and oxygen in the glass. The body could be considered almost full, and delivers ripe apples, white pepper, honey drew and that wonderful, nervous, acid. 90 points. 2014 Black – Consisting of 38% Antietam Creek merlot, 25% South Mountain cabernet franc, 25% Antietam Creek Petit Verdot and 12% Pad’s View syrah, you might as well call this a reserve wine as it comes from premier vineyards and is a brand-new release having spent a year and a half in oak before resting for another year and a half in bottle. The nose delivers bruised cherries, Acai berries, cinnamon, scorched Earth, hickory smoke and black pepper, and is utterly captivating with extended decanting. The palate is mouth-coating with round but firm tannins that will require time to fully release. Bright acid delivers a medley of red, black and blue berries, cinnamon, nutmeg, subtle olive and smoke. It finishes with a kick of cracked black pepper. This is just a baby, it stands to improve with your patience. 93 points now, likely more in the future. This is up there with the 2014 Malbec and 2014 Antietam Creek cabernet franc as my favorite Old Westminster reds to date.